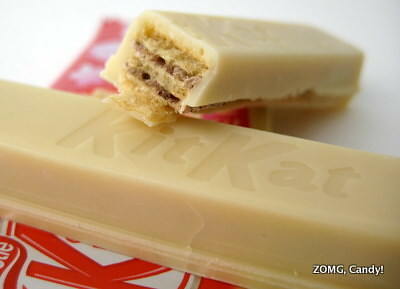 Japanese Kit Kat – Milk Coffee Flavor! This Kit Kat Milk Coffee came courtesy of my roommate’s boyfriend, Steve. I’m not sure how Steve got his hands on it, but I’m so thankful that he thought of sharing it with me! I can’t read any of the Japanese text on the packaging – if any readers know, feel free to leave a translation in the comments! 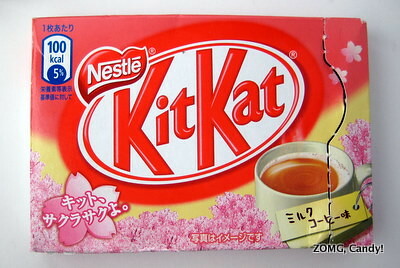 I think the cherry blossom in the bottom left corner means that it’s a Limited Edition/seasonal flavor. Like all the Japanese Kit Kats that I’ve had, these came in two individually wrapped sets of two fingers each. More packaging makes it less environmentally friendly, but it does help with portion control. I probably would’ve eaten my way through all four fingers if they hadn’t come separately packaged (tangent: what a weird sentence out of context). That would’ve been bad, as it would have meant no sharing. 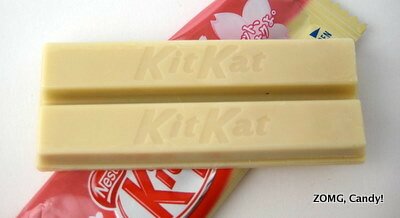 This Kit Kat was made from white chocolate. I’m usually not that big on white chocolate, but this was a pretty tasty white chocolate. It tasted fresh, creamy, and milky. From the looks and taste of it, the coffee flavor was stashed in the cream that sat within the wafers. It tasted deep and crazy roasty, like a fresh brewed pot of coffee. There was a light bitterness to coffee, but that only added to the genuine flavor. The coffee taste lingered in the finish, long after the chocolate had melted and the airy, crisp wafers had been crunched away. I loved this bar, with its great mix of textures and solid coffee flavor. An OMG from me. If you want other takes on it, check out what Jim and Jen had to say! Flavor-wise, I thought it merits a —. But I am glad I got to try it. It’s definitely a taste experience! Skor vs Heath Bar: Which Is Better?